Back in 2012, your Belgrade Lakes Association kicked off a major campaign to control the milfoil infestation at Great Meadow Stream and North Bay in Great Pond. Read below to learn more and please watch this space for current news and information. 2017 was another pivotal year in the fight to control milfoil in our Belgrade Lakes. With your help, we can stop the spread of milfoil. Please join us today. There are several ways you can help prevent the spread of Milfoil and other invasive Plants. Volunteers are needed this summer to work with teams of people to help remove milfoil identified at Great Meadow Stream, at the north end of Great Pond. There will be volunteer milfoil pulling days on Tuesday and Thursday throughout the summer. Volunteers will receive training and work in teams. Volunteers are also needed to help out on routine surveys conducted around Great Pond and Long Pond to search for invasive plants. Individuals can also help stop the spread of invasive species in our lakes by volunteering as Courtesy Boat Inspectors at the public boat ramps on Great Pond and Long Pond. 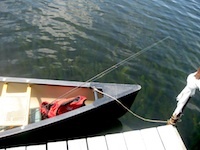 The Belgrade Lakes Association provides funding for paid Courtesy Boat Inspectors throughout the summer covering critical times at the ramps; but volunteers are also needed to fill in those times that cannot be covered by the paid staff. The STOP MILFOIL Capital Campaign had a $500,000 goal and was designed to meet our funding needs for the next three years. All monies raised has been used exclusively for milfoil related activities on Great and Long Pond. The STOP MILFOIL program is in its ongoing maintenance status as of this writing. YES! I want to join hundreds of others who support the work of the Stop Milfoil Task Force and stop the spread of invasive milfoil in our lakes. Or online via the below right Donate link dropdown menu, select Stop Milfoil. Variable milfoil was first positively identified in Great Meadow Stream in July 2010. 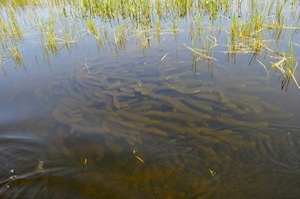 By September 2011 the milfoil infestation had spread into North Bay of Great Pond. Variable milfoil is an invasive aquatic plant that has no natural enemies and grows in very shallow areas all the way out to where the water is 15 to 20’ deep. Variable milfoil forms a thick mat on the surface that greatly reduces the recreational value of a lake, makes swimming impossible and boating very difficult. Left unchecked, variable milfoil could grow around virtually the entire shoreline of both Great and Long Pond. Milfoil can drive down shorefront property values and have a negative impact on local business. The milfoil in Great Pond is now in a very small area and can be contained ... if we really go after it this year. Our successful remediation had started in 2010 and run through 2016 to control the milfoil infestation. A Surface Use Restriction was established by the Maine Departments of Environmental Protection (DEP) and Inland Fisheries and Wildlife (DIFW). No boats of any kind were allowed in Great Meadow Stream or the north portion of North Bay in Great Pond initially from March 23, 2012 through September 21, 2012. Then no motorized boats were allowed from September 22, 2012 through December 31, 2012 and now, the same surface use restriction has been extended through 2016. A commercial milfoil mitigation company, New England Milfoil, is under contract to lead the hand pulling operation again this summer. A second milfoil pulling team and a survey team will once again be funded by the Belgrade Lakes Association with logistics provided by the Belgrade Regional Conservation Alliance (BRCA). Work on the water will start in late May and continue for 16 weeks to mid September. The Maine Lakes Resource Center will continue as our information center for all milfoil activities. Your help is needed including volunteers and donations of money, equipment, watercraft and housing. 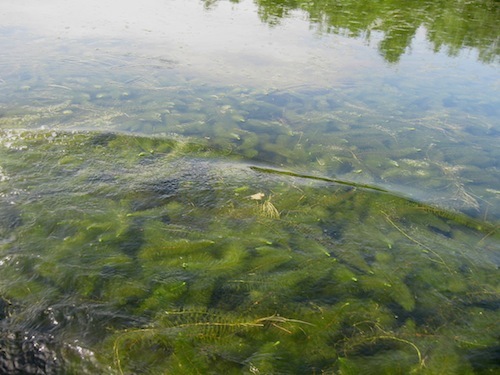 In 2012, 48,648 gallons of milfoil were removed. In 2013, 28,939. In 2014, 12,960 gallons were removed and 4,675 gallons in 2015 so as you can see, our remediation efforts have been highly successful but it continues to be an ongoing process to which your Belgrade Lakes Association is committed. Thank you once again for your support! Variable Milfoil Infestation of Great Meadow Stream and High Risk Areas of Great Pond and Long Pond. To see larger image click the map. A variable leaf milfoil infested lake.